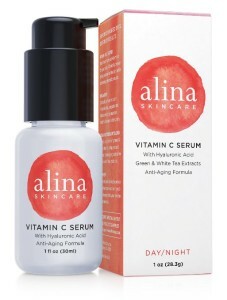 What does the Alina Skincare Vitamin C Serum do? The Alina Skincare Vitamin C Serum contains one of the best forms of vitamin C – an ester, which is the highest quality vitamin C, clinically proven to deliver better results than other types of vitamin C.
This vitamin C serum has an amazing scent due to the mandarin and grapefruit extracts and the it is chocked full of antioxidants to nourish and protect your skin from the effects of sun exposure and other free radical damage. Along with hyaluronic acid and other hydrating ingredients, your skin feels much softer and looks more radiant within a few applications. Your skin tone is more even, fine lines are less noticeable, jaw definition more defined and your skin feels silky soft and vibrant. Contains a 5% Vitamin C Ester (highest quality). More even skin tone and smoother texture. A more healthy, vibrant looking skin. Super hydration and collagen booster. Neutralizes the effects of free radicals. Who should use Alina Vitamin C Serum? With all of the daily stresses in our lives, as well as eating a poor diet and exposure to the sun, our skin can become dry, dull and tired looking. We might start to notice a few age spots or sun spots from too much exposure to the sun and pollutants, our skin tone looks uneven, we loose definition along our jawline and our skin doesn’t feel silky smooth anymore. So if you have any of these problems, then you can really benefit from using the Alina Vitamin C Serum, because it contains vitamin C to even out your skin tone and brighten your skin, as well as lots of super hydrators to plump up your skin and give your complexion a healthier and fresher appearance. This vitamin C serum was formulated for all skin types (even sensitive skin) and is very gentle and soothing on your skin. 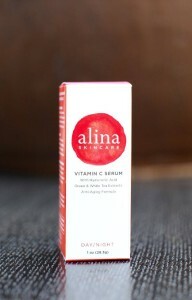 How do you use the Alina Skincare Vitamin C Serum? You can use this serum in the morning and the evening before you go to bed. So once you have cleansed your face and neck areas, just massage a few drops of this vitamin C serum into your skin. The serum will absorb quickly into your skin and you can then follow with your favorite moisturizer and makeup if desired. The Alina Vitamin C Serum contains hyaluronic acid, green and white tea, vitamin E, grapefruit peel oil, mandarin oil and Aloe. It does not contain parabens, phthalates or sulfates, and is made in the USA and not tested on animals. This serum contains a 5% Vitamin C Ester, which is a pure form of vitamin C and is not diluted with water. The percentage of vitamin C in many serums is usually expressed as ‘20%’, however this is the diluted form, whilst the Alina Skin Care Serum contains the undiluted ester of vitamin C. So the amount of vitamin C in this serum is not necessarily less than in other serums, the type of Vitamin C is just different. Vitamin C is a super antioxidant that is vital to cellular repair and helps to fight the ravages of free radical damage from too much sun exposure and pollutants in the air and in our diet. A serum that contains vitamin C will really help to even out your skin tone, particularly if you have patchy pigmentation problems, sun spots or age spots on your skin. Vitamin C also assists in the production of collagen in your skin, giving your jawline more definition and plumping your skin. Your skin looks fresher, cleaner and more youthful when you include a vitamin C serum in your daily beauty routine. Hyaluronic acid is a super hydrator, giving your skin a punch of hydration deep into your skin’s cells where it is needed. It is known as the fountain of youth because it can absorb more than 1000 times it’s own weight in water and is a perfect solution for dull, tired looking skin. Hyaluronic acid is also essential in the production of collagen, in fact as we age the amount of hyaluronic acid in our skin reduces, which is one of the reasons that we lose collagen. So when you add hyaluronic acid to your skin, collagen is also stimulated giving your jawline more definition and your complexion a more youthful, healthier glow. Green tea is super antioxidant, even stronger than vitamin C and White tea beats even green tea! So with both of these in your facial serum, you have a winning combination that makes your skin look healthier with less pigmentation problems, fewer fine lines and wrinkles, less dark spots and a more youthful glow. Another benefit of Green and White tea is that they have exfoliative properties, removing the dead cells form the top layer of your skin ad revealing the healthier, fresher skin beneath. Vitamin E has long been used in hand and face creams because of its antioxidant properties and its ability to hydrate our skin. As a potent antioxidant, vitamin E helps to reverse the signs of aging in our skin caused by free radicals and gives your skin a more vibrant, healthier appearance. Aloe has been used since the time of the Ancient Egyptians for its wonderful healing, soothing and anti-inflammatory properties. Aloe helps to heal dry, flaky skin, minimize itchiness, heal sunburnt skin, and because it is chocked full of antioxidants itself, it also helps to fight damage caused by free radicals and reduce pigmentation problems. Both grapefruit and mandarin extracts are high in antioxidants, so they help to reduce pigmentation problems in your skin and fight the damage caused by too much sun exposure and pollution. They also smell wonderful and give a fresh, crisp fragrance to the Alina Serum. With more than 1000 online reviews and most giving this serum a 4 or 5 star rating, you know that you are on to a winner with the Alina Vitamin C Serum. PROS: Some of the most frequent comments by customers are that their skin feels so much softer after only a few days of use, that the serum absorbs really quickly into their skin and it is definitely worth the money. CONS: Hardly anyone has given this vitamin C serum a one star rating, but of those that have done so, the majority didn’t feel that received a lot of benefit from this serum (not many though!). The Alina Skin Care Vitamin C Serum contains lots of great ingredients to hydrate, smooth and plump up your skin. You can also expect to see a more even tone to your skin, less noticeable wrinkles and a more healthy, vibrant looking skin. This serum is well priced and since it contains hyaluronic acid as well, you receive a big boost to your skin’s hydration. Definitely worth a look! Read my other vitamin C reviews here.